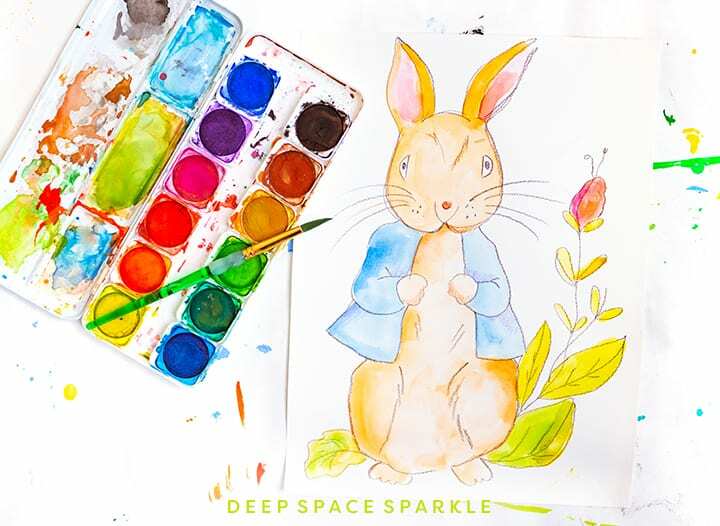 Need a quick and easy 40-minute art lesson for your Kinders or first grade class? 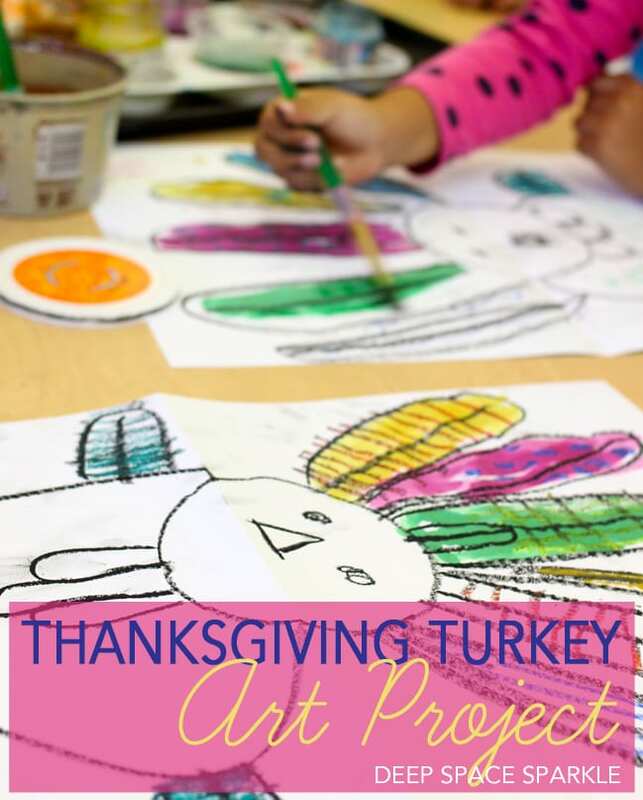 For the last day of my Fall rotation, Kinders each creates an adorable thanksgiving turkey. I hadn’t done a guided drawing lesson with this group yet, but since they have all settled down and have become quite good listeners, I figured a directed line drawing lesson was due. 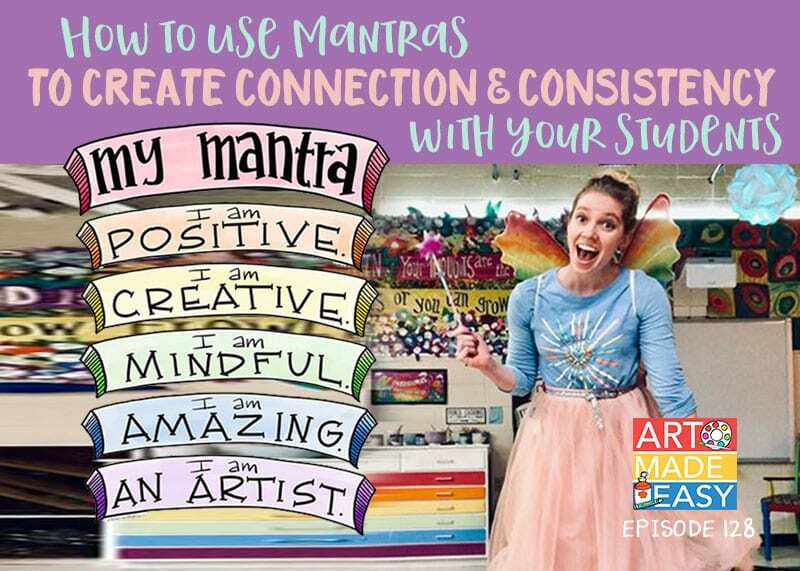 You’ll need a 12″ x 18″ piece of sulphite paper, black oil pastels, colored oil pastels, liquid watercolor paint, craft feathers, white glue and a small plastic container lid. I must admit that my own version of a Thanksgiving turkey looks more like a peacock than a turkey, but at the time, it was the best I could do. I experimented with a few body shapes before deciding that tracing a container top was the best way to begin this lesson with my Kinders. I was not alone with this assessment. A group of students who like to help me prep in the morning all agreed that tracing a circle was not only far cuter than my previous sample, and they liked the simpler lesson for their little buddies. Who’s to argue with sixth grade girls? Another KEY component in helping this project along was to fold the paper in half to create a crease line. You might think this is silly but for my group of Kinders, many have low spatial awareness and although we’ve been working hard on this, many drawings tend to start way at the bottom of the paper. Have you experienced this? Thought so. 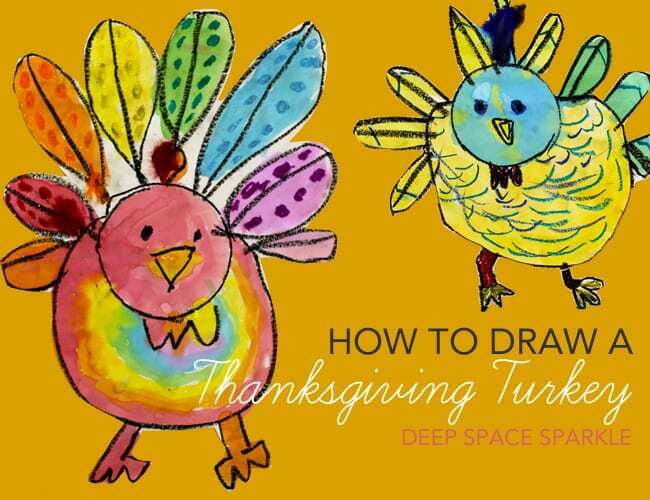 So, to draw a Thanksgiving turkey…. Fold paper in half to achieve a crease line and place container template on top of the crease line. This helps not only center the turkey but sets the stage for the turkey’s size. Trace container top with a black oil pastel. Draw two dots for eyes and an upside down triangle for a beak. Place oil pastel on crease line right next to the head and draw a BIG, FAT belly. Go all the way around to the other side of the head. Most kids (75%) got this so it really helps to use both the container top and the crease line. Draw a GOBBLE GOBBLE WIGGLY neck under the head. Add two legs by drawing two straight lines connected by claws. Repeat for second leg…or third as some Kinders did. Now draw the tail feathers. Like I said before, I must have been thinking peacocks because we made some very long tail feathers. Start by drawing a straight line above the head and go all the way to the top of the paper. Draw a big curved line around the line. Repeat around the sides of the body until you have as many tail feathers as you desire. With colored oil pastels, add lines, dots and patterns to the tail feathers and even to the body. Painting the turkey is easy-peasy with liquid watercolor paints. I place mine in baby food jars and give each child a brush. Not sure what it was with this group of Kinders but boy-o-boy, did they keep the paint clean. That’s usually the problem with little ones and liquid watercolors but this group really got into cleaning their brushes. I must have inadvertently threatened them somehow…. 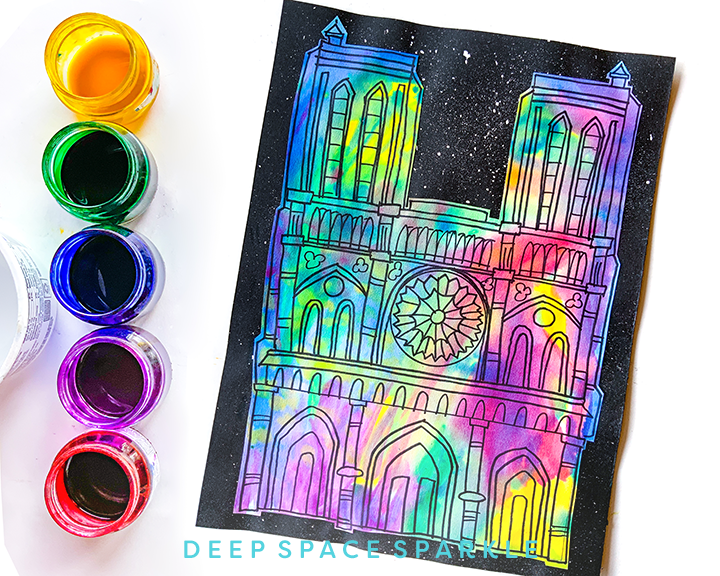 Paint each area or shape with a color of paint. No one listened to this. Some children used one color for the entire turkey and others painted rainbows. I love them all. When the children finished painting, add some white glue to the top of the head and allow each child to place a craft feather on the head. This is just for fun but a very good motivator to finish painting. Things don’t always work out the way you hope. Many Kinders have a very hard time with shapes and lines. It’s not only hard to control their little fingers but most often they don’t connect the shapes with an object like a turkey. I get a few strange looking creatures in each class and this is almost always from a younger Kinder. But, how precious does each students Thanksgiving turkey look? Need a handout? Click the image below to get a lesson delivered to your email inbox. I can’t believe what a great job with CUTTING they did! I love this! So did they do it ALL in just one class? Sorry…too good to be true! Although my Kinders usually cut out their projects, this was their last project until next year, so I cut them out with the help of some 6th graders. But they did draw and paint in one 40 minute class. I was wondering about the cutting out! Think I’ll have the Mom’s help the kids with the cutouts…Most of them are pre-k, as this is a playgroup. Ok I just thought of another question. I clicked on the link and read all about your liquid water colors, but I’m curious what the benefit of using them is. Can you explain that? Thanks! I use liquid w/c mostly for younger grades. The colors are rich and stay unmuddled. Trays tend to get a bit sticky, messy and muddled…which is what they should do but sometimes a pure color is what you are seeking. It’s just so easy for a child to dip a paintbrush into a colorful liquid then to extract the color form a dry cake. You should try them. You’ll love them. Thanks! I did use liquid for a robot drawing painting but I didn’t buy it liquid, I diluted the small oval in some water and they dipped that way. I don’t have baby food jars, I’m collecting so I can use liquid w/the little ones! I am going to start this project next week so I’ll just use what I have. 🙂 Thanks for responding and thanks for your tips! I just did these today with my Kinders! They turned out awesome! 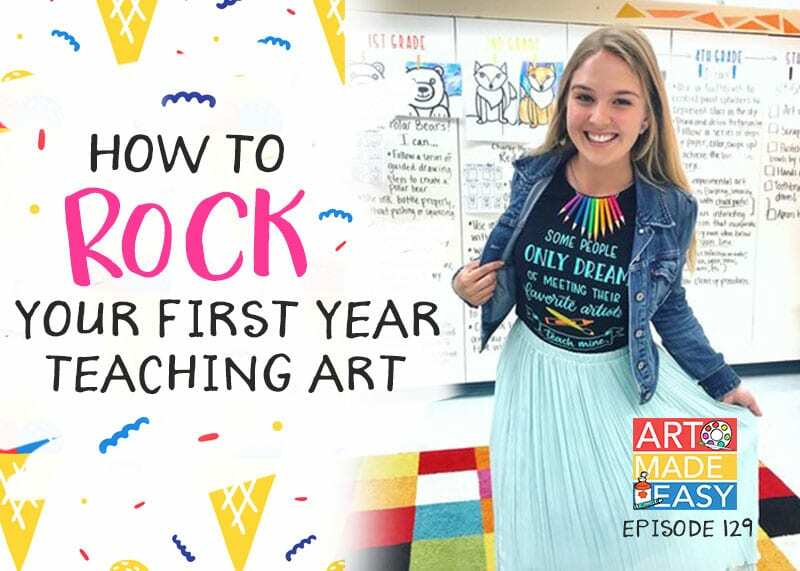 In my school district, we do not have art teachers, so classroom teachers are expected to teach art (yikes!). I’m so glad I found your blog! Good for you! And yes, aren’t these turkeys super cute? 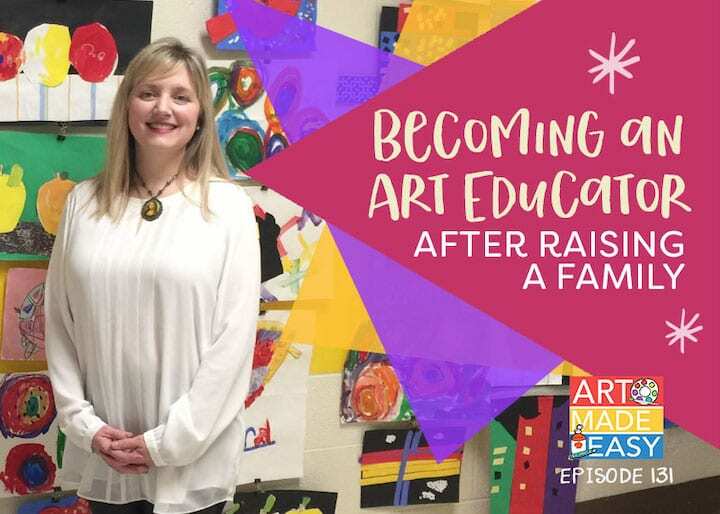 I just love it when the art teacher is skilled enough to make all of the kids’ art look so good – it really makes the kids proud and inspires them. This pin has been doing really well for me on Pinterest! I hope you’re getting some traffic back from it! I am reading through the directions but I don’t see where you cut the turkeys out but I can tell they are cut. Was that the last step? Yup. The turkeys were cut out. You don’t have to though. In fact, the kids can paint a background. You’re probably wondering if I cut out the turkeys or if the kids did. My 6th grade students helped cut them out. I hate to steal without sharing. 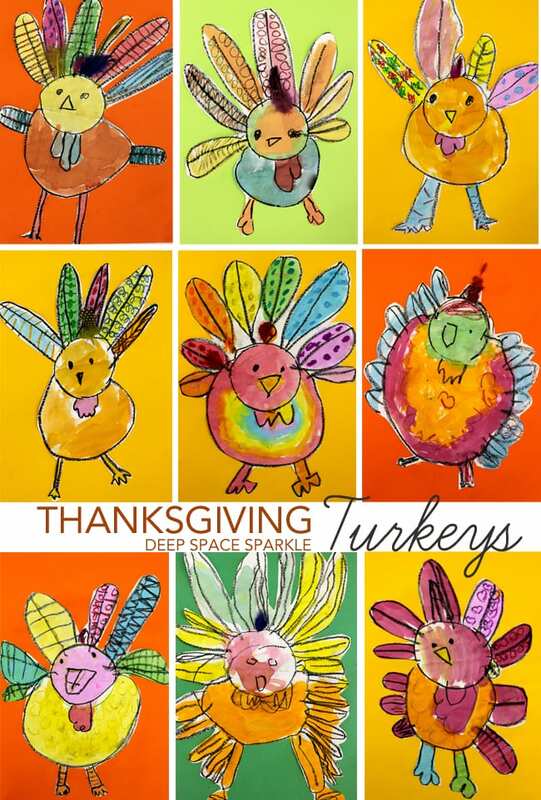 I just love these and our kinders are studying turkeys in the classroom, so the timing is grand. Here is a project I did with my kinders that is similar–only with owls! I can’t tell you how much we are enjoying your website, especially the videos. 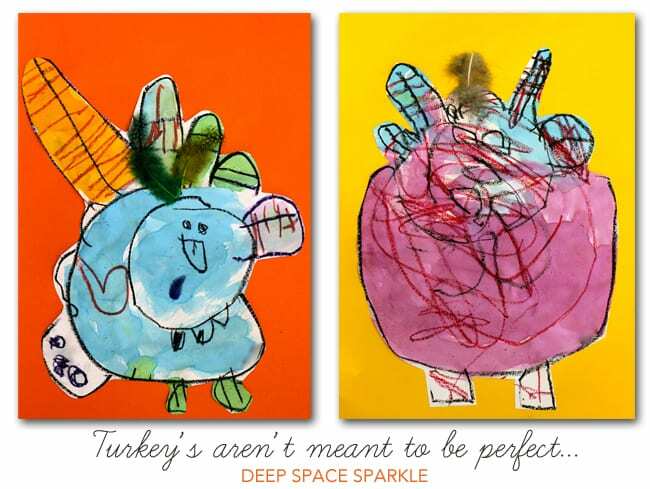 My three kids (7, 6, 4) make these turkeys this morning and had such a great time being creative! Thank you for sharing your talents with us. Happy Thanksgiving! Thank you right back, Sharon! I’m SO SO SO happy that you sat down with your kids and did art. That is something I hardly ever did–really! All three at once? never. Thanks so much for commenting. 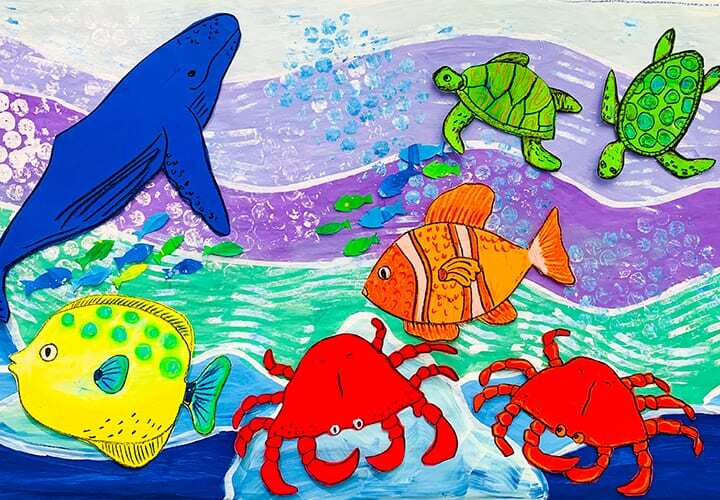 Love this project, my kindergartners love to paint! They turned out great! This worked out beautifully to illustrate some thanksgiving writing with my 2nd graders. 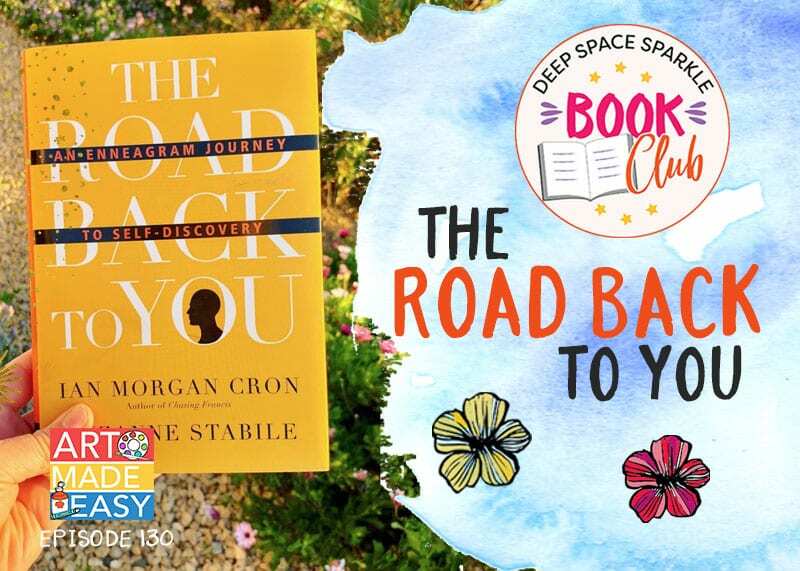 Thank you so much for sharing this! These turned out so well and my grade ones are so proud of themselves! All of the school has been stopping to give us compliments. Cutest art I’ve ever done!!! Thank you so much for sharing!!! When I click on the download for directions it tells me the page does not exist. Is it still available? I really want to do these with my K kids! Seasonal Freebie.. you can download it now. Thanks! We removed it form the store because it was a seasonal freebie. You can download now. Thanks! I CANNOT wait to do this activity. Your kids did a great job! I can’t wait for November to get here. Is there not an easier way to get the download for the instructions for the lesson other than to enter my email every time? These are wonderful! It looks like you’re using crayons. Did the children use those crayons or did you have them use pastels? Does it work just as well with the crayons? You can use crayons or oil pastels. Oil pastels tend to be waxier and therefore deliver a strong line. Little kids dont need to press as hard with oil pastels. Crayons can be a bit hard. Faber-Castell has amazing crayons. This is a wonderful art project for our daughters kindergartners! 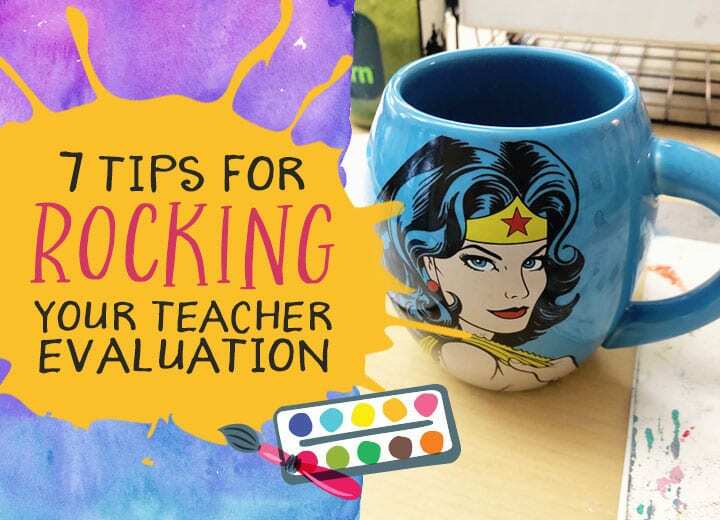 She’s a first year teacher and I look for project she can use in her classroom – I’m an old teacher myself, semi-retired and love my profession! Thank you for this cool website! Wonderful! Would love to try with my kiddos. Please send me the directions! Thanks! This is adorable. Will you send me the example? 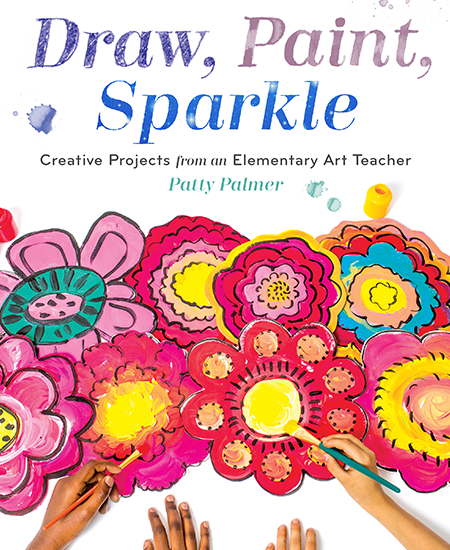 I taught art to K – 6th for 15 years, and loved every minute of it. I have been asked to tutor a 6 year old in art, and will be back for fresh ideas. Thank you for giving me a place to go to find new and exciting for him to do! This looks like fun! This looks like so much fun! I have been asked to tutor a 6 year old in art, and can’t wait to try it. Thanks for being such a valuable resource. We’re happy to send you the PDF. Just scroll to the image in the post that says Download PDF. Then, click the box, enter your name and email in the pop up and you’re all set. We’ll email you the download. Be sure to check your spam or junk folder as sometimes our emails end up there.